Home Entertainment What Happened to MoviePass and Can It Survive? What Happened to MoviePass and Can It Survive? It sounded too good to be true — $10 a month for nearly unlimited access to your local movie theater. Well, for MoviePass and its millions of loyal users, it turns out it was too good to be true. So, what TF happened to MoviePass? Well, in a nutshell, it ran out of money. 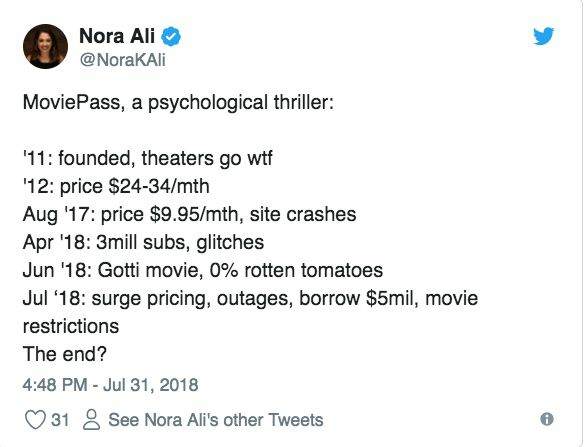 This past May, MoviePass burned through $45 million and is expected to lose another $45 million in June, according to TheNextWeb. The company also secured an emergency $5 million loan this week — but it’s not looking good. Without money, MoviePass has no way to issue a credit to the vendor (i.e. the movie theater), which means no movie tickets for anyone. Users have noticed MoviePass making some last-ditch efforts to save the service, from surge-pricing to keeping blockbuster movies off the app until two weeks after their release date. (If you want to watch Mission Impossible: Fallout using MoviePass, you’re out of luck). MoviePass attempted to reassure users who were having issues buying tickets, tweeting, “We are still experiencing technical issues with our card-based check-in process and we are diligently working to resolve the issue. In the interim e-ticketing is working. We apologize for the inconvenience and appreciate your patience while we resolve this issue,” but things may only get worse. Why did MoviePass raise its prices? And surge pricing? That’s not going anywhere either. Meanwhile, movie theaters aren’t complaining. According to the MoviePass CEO, subscribers spent around $11 million on AMC concessions alone. Others suggested some pretty impressive ideas to keep the company afloat. We know all about you. We get an enormous amount of information. Since we mail you the card, we know your home address … we know the makeup of that household, the kids, the age groups, the income. It’s all based on where you live. It’s not that we ask that. You can extrapolate that. Then, because you are being tracked in your GPS by the phone … we watch how you drive from home to the movies. We watch where you go afterwards, and so we know the movies you watch. We know all about you. However, he took back those statements, saying the company has turned off its location tracking. 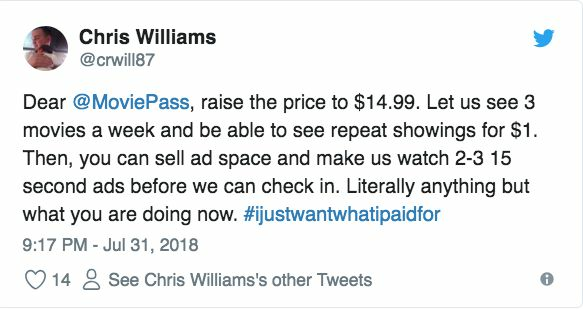 Right… Either way, drastic changes need to happen to ensure that MoviePass users can watch a movie a day for the rest of their lives for less than the price of lunch.